Occlusion is the study of the way a patient's teeth function together, how they touch and how the jaws move. The occlusion usually describes the touching surfaces of the teeth. All of dentistry is affected by your occlusion and occlusal forces. Every time you have a restoration (filling, crown etc.) your dentist should carefully assess the effects on your occlusion. Imagine teeth closing together with great force. This happens every time we chew but much greater force is used if we clench, particularly in our sleep. This can cause overloading of the teeth - wearing and breaking, sore muscles and sore and stiff jaw joints. If the occlusion isn't properly balanced you may experience chewing or opening problems or pain such as headaches, jaw and face pain, eye, neck or shoulder pain. 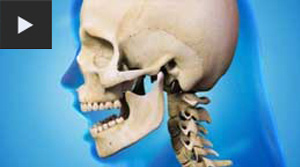 This is collectively known as temporomandibular joint (TMJ) disorder. Patients who clench or grind their teeth (bruxism) are particularly susceptible. Our dentists are all trained in occlusion and can diagnose the cause and recommend treatment to help alleviate the problem. Depending on the origin and severity of your problem, treatments can range from making a customised night guard, replacing missing teeth or adjusting/replacing any ill-fitting restorations. Other treatments would include orthodontics or even surgery. The most important thing to do is to see your dentist as soon as possible so that your problem does not become worse over time and require more drastic measures to correct. Please contact the practice if you would like a free consultation 02890 471070.